I am a personal injury lawyer working out of Murphy Battista LLP’s Vancouver and Surrey offices. Prior to attending law school, I attended the University of British Columbia where I obtained a B.A. with a double major in history and political science. After my call to the bar in 2009, I carried on a successful civil litigation practice at a large, full-service law firm in Surrey, where I became a Partner in 2015. I gained valuable experience working as both plaintiff and defence (ICBC) counsel prior to joining Murphy Battista. My practice now focuses exclusively on representing individuals who have been injured. I take pride in working to obtain fair and reasonable settlements, and when necessary, proceeding to trial on behalf of my clients. A featured guest speaker on the Law Show on CISL 650 AM, I have discussed topics relating to personal injury and motor vehicle accident claims. I have also been interviewed by the CBC for comment on various legal matters. In my spare time, I enjoy playing hockey, reading and most of all spending time with my family. In Del Bianco v. Yang et al., 2019 BCSC, Kevin Hyde and Raj Dewar were counsel for a 34 –year-old third generation stonemason who sustained injuries to his neck and right shoulder in two motor vehicle collisions. ICBC denied fault for both collisions until 2 days before the start of trial. The Plaintiff proceeded to trial and was awarded compensation for his injuries and losses in the amount of $673,770 plus costs and disbursements. The Plaintiff was also awarded double costs from the time of his formal offer to settle, beating ICBC’s formal offer to settle by over half a million dollars. The oral reasons included damages for $130,000 for pain and suffering, $98,600 for future care, and $375,000 for loss of earning capacity. 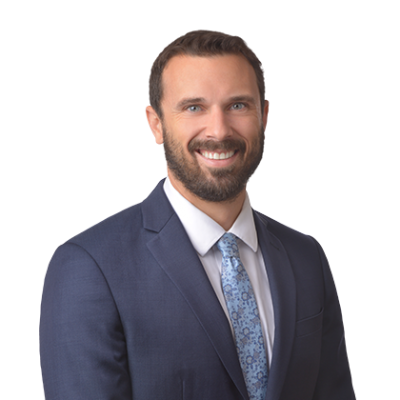 Kevin Hyde was co-counsel for a plaintiff property developer who successfully sued an assignee of a contract of purchase and sale on an indemnity agreement for damages and costs amounting to $125,255.77 that arose out of a failed real estate transaction. Full indemnification for legal fees was also ordered following the trial. Kevin Hyde was counsel for a plaintiff property developer who successfully sued the Defendant on a failed real estate transaction, obtaining damages for breach of contract, as well as pre-judgment interest and costs. In Joba v. Basant Holdings Ltd, Kevin Hyde successfully defended a corporate client in a contractual dispute. The claim was dismissed in its entirety and costs were awarded to the client. I just settled my ICBC personal injury claim with Kevin Hyde and am very happy with my settlement and the attentive manner in which Kevin and the staff at Murphy Battista handled my case. I would highly recommend Kevin to anyone wanting a caring, professional, attentive, quality result. Thank you Kevin , Erin and all at Murphy Battista for helping me get my life back! I want to say thank you to Kevin Hide, Steven Gibson, Scott Stanley and crews for helping me with my ICBC case. I would recommend this law firm to everyone that’s needs a professional and caring law firm. Steven, I thank you for being there for me at the time when I needed you most. Scott, this was a very difficult situation for the extenuating circumstances that presented themselves, and they went above and beyond to ensure my interests were always at the forefront. I was amazed at how much Kevin Hikes had dug into my files, and how he was indeed putting his full attention to this matter, which realistically is a small dollar amount in the grand scheme of things, but all that didn’t matter to Kevin, his pride and focus was on getting me the best result he could under the circumstances… even though I was in an accident that was not my fault, Murphy Battista continued to cover the cost of my rehabilitation. Kevin’s explanation of the risks and consequences of going to court, and the costs associated, and the rewards I might expect from such a judgment and possible subsequent appeal, helped me better understand that I was in a very unique position, between a rock and a hard place. Kevin, Thank you, Thank you, Thank you, after 4.5 years of this turmoil, your work and efforts got me the most I could expect under the unique circumstances that presented themselves, and for that I am truly grateful. You’re pride and focus helped me to write a final chapter in dealing with ICBC! My practice focuses exclusively on representing individuals who have been injured. I take pride in working to obtain fair and reasonable settlements, and when necessary, proceeding to trial on behalf of my clients.